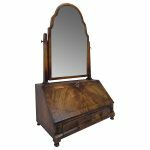 Circa 1890, unusual mahogany display cabinet, the top with open cast brass three quarter gallery which is shaped and stylish. The top of cabinet itself is glazed and has a cast brass moulding. The front of the cabinet is one large door and each side of the door and gables are glazed and has the same brass beading. Inside has three shaped glass shelves, and the inside of the cabinet has fabric covering. There are various cast brass mounts which have foliage, quiver of arrows and a flaming torch. The base of the cabinet has a cast brass shaped on the apron and stands on four simple legs, the front two with cast mouldings on them. Excellent colour, good condition.